Products are essentially merchandise in their packs which is purchased from suppliers or brewers and then sold to customers. Examples of products are Coors Light six pack, Amstel Lt 1/2 Keg, or Blue Moon 4/6/12 Ln. Each product requires a separate record. The records are for the primary packs of the product, but alternate packs (alt-packs) may be added to the record. In order for employees to change the price, the "May Change Prices" checkbox on the Permissions Panel must be checked. When first creating a product, the Price Like field is available. This field was designed to assist with the quick creation of product records by filling in the Price, Deposit, and Override based on the "price like" item. If the checkbox Same discounts is checked, then after the new item is added to the database, the product is added to the Promotions that the "price like" item is located in. After the record is saved, this information no longer becomes available for edit. Click the command button New on top bar. Specify record, either by selecting the provided number or creating your own. Add information - Name, Description, Pack Name, Barcodes, Product Permission Flags, Front Line Price, Category, Brand, and Package. Click the command button Save on top bar when finished. Zero out the inventory for the pack by either zero-ing out a count or creating an inventory write-off. Click the command button Erase. When finished making changes, click the command button Post. Additional information about the product can be inserted here. For more information, see Product More Panel. The dimensions panel (added September 2010) contains pack arrangement and size information. The Notes panel allows any additional notes about the selected product. Alt-Packs are any other form of packaging that the product may be purchased and sold in. This packaging is different than the primary pack. There can be as many alt-packs as needed. For more information, see Alt-Packs. This panel is used to create kits for the specific item. If there is an alt-pack for an item, then there cannot be a kit for the product. For more information, see Kits. The supplier panel is used to add information on who supplies the product to the warehouse. There can be multiple suppliers added to a product using this panel. Additionally, the suppliers may be based on the pack type. For more information, see Supplier. This panel displays any product competitor information. For more information, see Competitor. This panel shows the history and prices of the selected product. This includes any Price Book prices. This panel shows any promotions that the selected product may be in. Additionally, this panel shows the amount off and rebate amounts for comparison purposes. In April 2010, changes were made to add more information about the promotions to this panel. Use the radio buttons at the bottom of the screen to alter between promotional types. If the user has the correct permissions, they may be able to set the promotional amounts for the products in the promotions through this panel. To view the promotional record's section, click the hyperlink. For more information on promotions, see Product Promotions. The sales panel is a quick reference to see the amount of product sold within the selected time frame. For more information, see Sales Analyzer. The SRS panel allows the user to set the SRS supplier and product ID. This panel is used to set up warehouse-specific settings for the selected product. Each warehouse is listed as a column in the grid. Par Level - Enter the standard amount to have in inventory. Minimum Level - Enter the amount the product should not fall below. Maximum Level - Enter the amount the product should not exceed. The information entered in this section is used by the forecasting feature when creating a new purchase. Par DOH - Enter the standard number of days worth of product to have in inventory. Minimum DOH - Enter the number of days worth of inventory the product should not fall below. Maximum DOH - Enter the number of days worth of inventory the product should not exceed. The information entered in this section is used by the Warehouse Assistant when calculating if a transfer is needed to maintain levels at each warehouse. Cases per full pallet - Enter the number of cases on a full pallet. The information entered in this section is a per-warehouse override for what is entered on the dimensions panel. Stock Location - Enter the picking location this pack-size is placed. Backstock Location - Enter the backstock location this pack-size is placed. Check Digit 1/2/3/4/5 - Enter the check digit(s) for this pack-size. Pick Sequence - Enter the pick sequence for this pack-size. Layer Pick Sequence - Enter the layer pick sequence for this pack-size. Flags are user created reporting fields. This panel is used to attach these user created flags to products. It is possible to have up to 40 product flags. For more information, see Flags. This panel shows the current ending inventory levels, on truck levels, along with all pending transactions for an item. This information may be broken down into more details based on orders for uncommitted and orders on trucks. This panel was known as the "Inventory 2 Panel" but was changed to Inventory Detail Panel. To access additional warehouse information, click on the plus sign in the warehouse column. Current - This is the current level of inventory. On Truck - This is the amount of inventory on the truck. Committed - This is the amount of inventory committed to orders. Purchased - This is the amount of inventory that has been purchased and awaiting delivery. Tr/Out - This is the quantity of product on pending outgoing transfers. Tr/In - This is the quantity of product on pending incoming transfers. Universal Product Codes (UPC) and Global Trade Item Numbers (GTIN) can be inserted here. This panel will be used to populate reports throughout eoStar, as well as, if selected, print these numbers on invoices. In order for employees to access this screen, the "Records>Products>ID Panel" checkbox on the Plugins Panel must be checked. The inventory of the product will be shown here. Additionally, the audit trail for the product is shown. The top panel lists the location of the product such as the warehouse, truck, or drop point, and if that inventory is available, committed, or allocated. If any inventory is pending to be received, then the amount will be listed in the "To Receive" column. On Hand - This is the amount of product that should be located in the system. This includes the Committed amounts. Picked - This is the amount of product that has been picked for the orders. Alloc - This is the amount of product that is allocated to customers. The allocated amount is removed from the amount Available. Available - This is the amount of product that is available to be sold or written-off within the system based on the location. Committed - This is the amount of product committed to orders within the system. To Receive - This is the amount of product expected to be received through Purchases. Location - This is where the product is located in the system. 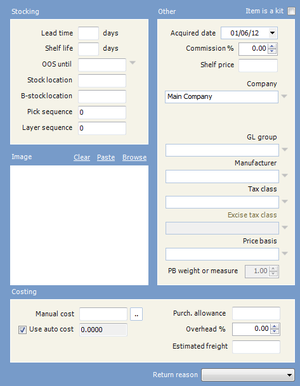 The Laid-In Costs panel is used to examine the laid-in cost for the selected product. Select the cost components by clicking on the hyperlink and checking the checkboxes correlating with the type (Price (FOB), Discount (SPA), Freight, Deposit, Excise Tax, and Cost Components). Each component will display on the chart for the selected warehouse, supplier, and pack. The various components will total the amount shown at the top of the chart. The charts on this panel will not be plotted if there is no supplier associated with the item and there are no entries for the item in the Laid-In-Cost Manager. For more information, see Laid-In-Cost Manager. Any web pages for the product may be linked in this panel. This could also contain the supplier's or brewer's web address for quick access of information on this product. With the addition of the Beer/Wine Plugin this panel becomes available. This panel contains the equivalency information as well as the state ID number. For more information, see Product Records Beverage Panel. This panel is used to add information on wine products. For more information, see Product Wine Panel. Added in January 2010, this panel is used to add beer specific information to the product. This includes alcohol by volume, IBU value, recommended food pairings, etc. This information is simply text fields. Added with the Product Summary Plugin, this panel shows useful information for the selected product. For additional information, see Product Records Summary Panel. This panel has any reports about the product. For more information, see Reports Panel. Categories are a way of organizing products that might be a variety of brands. For instance, the category of beer may be applied to several brands like Miller and Heineken. Occasionally, Product Categories may include dunnage (empty packs like empty kegs or pallets). To prevent this category from showing up in ION Reports, check the check box Omit From ION Reports. In August 2009, changes were made so that the inventory valuation and inventory level reports ignore the “Omit from ION” setting for product categories. Products are added into a category through a drop down arrow on the Product Records. The checkbox Category is used for POS Items is used to mark a category as belonging to a POS Items. This option is added with the POS Plugin. Click New on top bar. 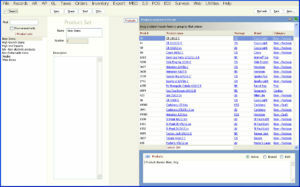 Specify record number for the record, the system can select a number or the user can create their own. Add information- Name and ION Reporting information. Click Save on top bar when finished. This panel lists all the products in the associated selected record. Products are added into a category through a drop down arrow on the Product Records. This panel shows any information dealing with the prices of the selected brand. This includes the base prices and the levels. It is possible to filter this list using the options at the bottom of the panel. This panel shows any related promotions information for products in the selected category. This shows the summary of retail sales by month for the Category selected. There are advanced options available. For more information, see Sales Analyzer. This panel shows the inventory of the selected product category. The audit information is located at the bottom of the panel. This segment shows any reports related to the Product Category. The selected report can be changed under the Report segment at the bottom and by the time period. The reports shown here can be sent to both the printer and excel. For more information, see Reports Panel. Product Class information on the Records>Product>Records screen. Product classes are used to create a group of products based on the type of product. There are ten available Product Classes. These product classes can be renamed. 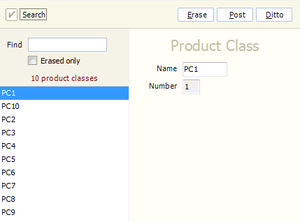 To rename a product class, select the record and type in the new name. Examples of possible product classes are kegs, wine, beer, non-alcoholic, and liquor. If the product class contains all alcoholic beverages, check the checkbox labeled Is Alcohol. No new product classes may be added. There can only be a maximum of ten in a database. After the product classes have been set up, go to Records>Product>Records. Using the drop down arrow, select the Product Class. If the class is an alcoholic class, the script "Alcoholic Product Class" will appear below. After the product classes have been set up, go to Records>Product>Packages>Records. Using the radio button, select the product class for the package record. If there is no specific Product class for a product, then select No Default Product Class. In order for a product class to be delivered, the class needs to be applied to a truck. After the product classes have been set up, go to Records>Truck. Under the heading Product Classes, check the checkboxes next to the associated classes the truck can carry. This panel lists all the products in the associated selected record. 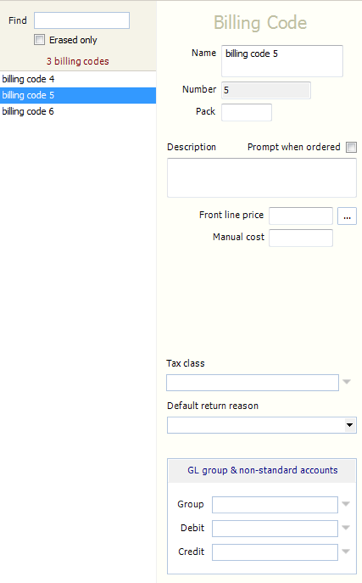 Products are added to a class through a drop down arrow on the Product Records. This panel will have any associate reports for the selected product class. For more information, see Reports Panel. Brands are the name brand of an item. For example, Budweiser would be a brand name. Products are assigned to a brand through the drop down arrow on the Product Records. Brands are also used as a reporting and grouping field in ION Reports. Add information - Name and/or Private Label, Brand Manager Assignment. This panel lists all the products in the associated selected record. Products are assigned to a brand through the drop down arrow on the Product Records. This panel shows any related promotions information for any products for the selected brand. For more information, see Product Promotions. This panel creates either trend or sales reports for a given time frame using the Sales Analyzer for the selected brand. For more information, see Sales Analyzer. This panel shows the inventory of the selected product brand. The audit information is located at the bottom of the panel. Here, the website and logo information to the Brand company may be linked. This panel is used to specify information about the sample billback. For more information about Sample billbacks, see Samples Tracker#Sample Auto Billbacks. This panel is added with the addition of the Beer/Wine Plugin. For more information, see Brand Beer/Wine Panel. This segment shows any reports related to the Product brand. The selected report can be changed under the Report segment at the bottom and by the time period. The reports shown here can be sent to both the printer and excel. For more information, see Reports Panel. This feature is added with the addition of the Beer/Wine Plugin. Brand families are a way of assigning territories based on large sets of brands in eoStar. Brand families are used in ION Reports where it is possible to isolate information based on both brand families and brands. Product brands can be assigned to a Brand Family through the Brand's Beer Wine Panel. Multiple brands can be in a brand family. In order for a customer to purchase the products within the brand family, they should be assigned that brand family through the Customer Beverage Panel. This will affect the customer's list of available products for purchase on the Customer Records Can Buy Panel. Click the command button New. Type in information - Name. Go to Records>Product>Brands beer/wine panel. Using the drop down arrow, select the brand family. Go to Records>Customer>Records Beverage Panel. Using the drop down arrow under Brand Family Assignments, check the Brand Families to include for this customer. This panel shows any reports related to the selected Brand Family record. The selected report can be changed under the report segment in the bottom box and by the time period. The reports shown here can be sent to both the printer and excel. For more information, see Reports Panel. Package types are a way of organizing products into groups. An example of package types is cans. To search through the records check the Search box located on the left. Either type the name in the Find box, or search through erased records by checking the show erased only box. This segment shows any reports related to the package type. The selected report can be changed under the Report segment at the bottom and by the time period. The reports shown here can be sent to both the printer and excel. For more information, see Reports Panel. Packages are any containers such as crate or six pack. Create a Package Type before creating package records. The Case and Keg checkboxes are used to mark the records as either a case or keg. If these checkboxes are not used, then the record is considered an Other. This information is used throughout the application in the Order Tracker and the Dot Matrix Plugin layouts. Additionally, only packages that are marked as either cases or kegs will be sent to the Vertique export. Specify record by either selecting the provided number or creating your own. Add information- name, package type, container information, and Default Product Classes. Specify if the package is for a Case or Keg item. Using the drop down arrow, select the package. This panel lists all the products in the associated selected record. 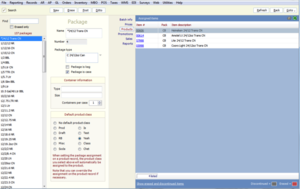 Package records are applied to products on the Product Records. In this panel it is possible to see the prices including the base price and levels for items with this package type based on the Price Book. Any promotions for this package record will be shown here. For more information, see Product Promotions. The Sales Panel contains information based on the sales of the specific package records. For more information, see Sales Analyzer. 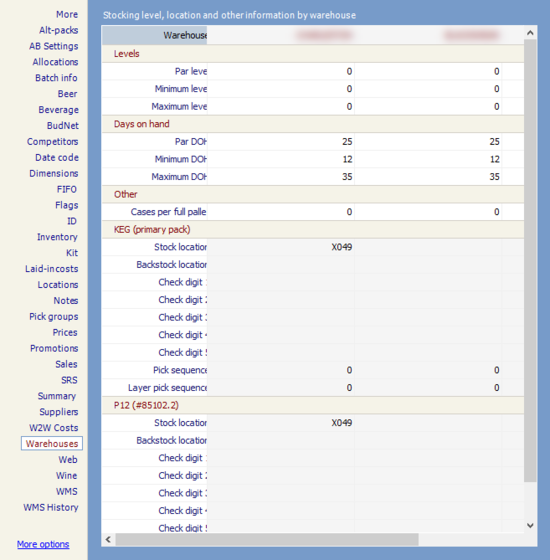 This panel shows all the inventory associated with the package record, including audit information on the bottom of the panel. This panel contains any reports about the package record. For more information, see Reports Panel. The Per Package Delivery & Freight Charge screen, added with the Delivery Charge Plugin, is used to add charges for each package type. After changes are posted in this screen, the delivery and freight charges selected will be automatically added to the orders placed. To exclude customers from paying the charges for every order they place, go to the Delivery and Freight Charge Manager and for the Per package rule, select Do Not Charge. In order for employees to access this screen, the "Records>Product>Packages>Per Package Delivery & Freight Charges" checkbox on the Plugins Panel must be checked. Records>Product>Packages>Per Package delivery & Freight Charges. 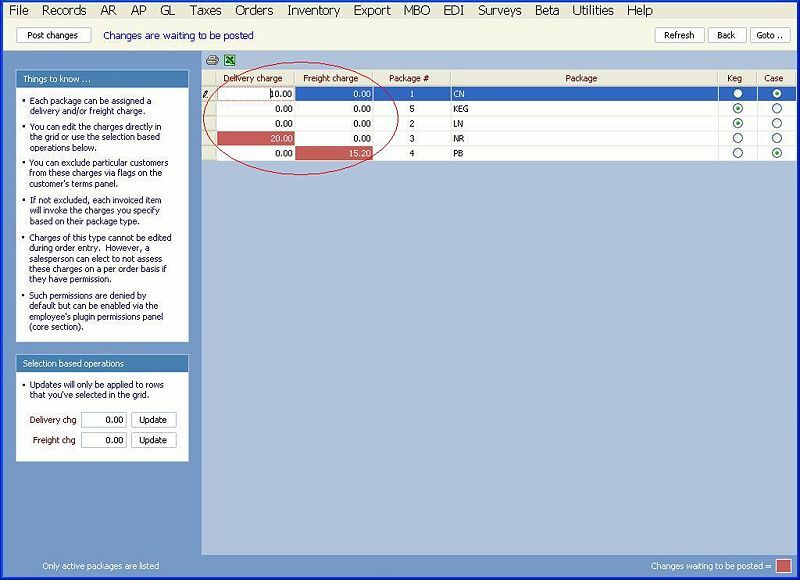 Select the package type and in the box titled Selection Based Operations, type the delivery or freight charge and select Update. When finished making changes, click the command button Post Changes. Beverage types are a way of organizing products for taxing and reporting purposes. This is added with the Beer/Wine Plugin. 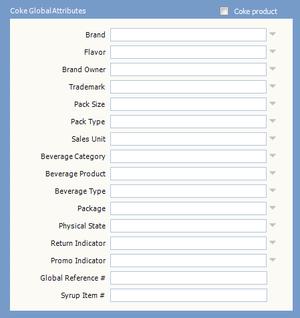 To add a product to a Beverage Type, use the drop down arrow on the Beverage Panel in the Product Records. Specify the record number, either by selecting the provided number or creating your own. Click the command button Save. After creating a Beverage type record, go to Records>Product>Records Beverage Panel. Using the drop down arrow, select the beverage type. This panel contains a list of all the products which are assigned the selected beverage type. To add a product to a Beverage Type, use the drop down arrow on the Beverage Panel in the Product Records. This panel has any reports about the beverage type. For more information, see Reports Panel. Manufacturers are the creators of the product within the system. This information is typically tracked for reporting purposes. This page explains how to create and manage the manufacturer records. Specify record and employee number for employee record. Either select the provided number or create your own. Add information - Name, Ship to, Address, Mail to. To search through the records check the Search box located on the left. Either type the name in the Find box, or search through erased records by checking the show erased only check box. This panel lists all the products in the associated selected record. This shows the summary of retail sales by month for the manufacturer selected. There are advanced options available. This is the inventory shown for the manufacturer. The manufacturer's website may be linked here. This segment shows any reports related to the Manufacturer. The selected report can be changed under the report segment in the bottom box and by the time period. The reports shown here can be sent to both the printer and excel. For more information see Reports Panel. Add information - Name and description. On the products panel, select the drop down arrow. Check the check boxes next to the items you wish to include or exclude. Using the drop down arrow, select the Product Set. This panel is used to add or subtract items in the Product Set. In 2009, this screen was integrated into the Configure Database Product Flags Panel and some of it's functionality was deleted. This screen will not appear in 2009 versions of eoStar. Product flags are user created markers that track products. Flags can be used in reports. See Flags. Note: Only the Database Administrator can create Product flags. Type the flag names next to the Flag number. When finished making changes, click Save. From the Records>Product>Flags select the flag you wish to set a record with. Go to Records>Product>Records Flags Panel. Using the drop down arrow, select the Flag and the flag record. Alt-Packs are used to define the different sizes one product is bought and sold in. For instance, a product may be used as a case, a bottle, or a pallet. If you use the case size the most, you would set the primary pack size to case while setting up the bottle and pallet as Alt-Packs. Alt-packs are subject to the same product permission flags (can buy, can sell, can issue, etc.) as primary packs. For instance, a particular wine may be sold by the case (primary pack), the bottle (alt-pack), and received/stored in pallets (alt-pack), in addition to cases/bottles. In order to properly erase an alt-pack, the inventory for the pack should be zero. To zero out the inventory, either do a count or create a write-off ticket. It is not possible to erase an alt-pack that has inventory, or that is listed on a pending order, transfer or purchase. Go to Records>Product>Records Alt-Pack panel. Click the command button Add New Pack on top bar. Add information- Number, Pack Name, Stock Location, Product Permission Flags, Front Line Price, Category, Brand, and Package. The Alt-Pack number will be essentially the same number as the product with a decimal. For example, 195928.1 or 195928.2. The primary pack contains option - This radio button indicates that this alternate pack is smaller than the primary pack. The number selected, in the spinner to the right, specifies how many of these Alt-Packs are in the primary pack. For example, if this Alt-Pack is a Box of 12 units, and the primary pack contains 4 of these packs, then the primary pack would hold 48 units. This alternate pack contains option - This radio button indicates that this alternate pack is larger than the primary pack. The number selected, in the spinner to the right, specifies how many of these Alt-Packs are in the primary pack. For example, if this Alt-Pack contains 4 of the primary packs, and the primary pack is a Box of 12 units, then this Alt-Pack would hold 48 units. Cost - This is the cost of the alt pack. This field is updated after the first purchase of a product within the family. For example, someone purchases the primary product and eoStar updates the cost of all the alt packs. The price is based on the quantity in the alt-pack compared to the primary product. Even if an alt pack cannot be purchased, the cost will be updated. For example, you purchase in pallets and sell in cases. Once that pallet is purchased, the case cost will be updated. Click the command button Post on top bar when finished. It is not possible to erase an alt-pack that has inventory, or that is listed on a pending order, transfer or purchase. To see which inventory as well as the amount of inventory is associated with the alt-pack in the system, go to the Product Records Inventory Panel. If the alt-pack was incorrectly erased, Rutherford Support can "un-erase" the alt-pack so that it can properly be erased. Zero out the inventory for the alt-pack by either zero-ing out a count or creating an inventory write-off. This should only be for the inventory for the alt-pack that is being deleted. Click the command button Drop. Only add the product back using the Enter Repacks functionality or through a negative inventory write-off if the erased alt-pack’s inventory was NOT zeroed out before the alt-pack was erased. For instance, if there are three pallet sized alt-packs for a product, and the inventory was NOT zeroed out before the alt-pack was erased, then the alt-pack was incorrectly erased. To fix this issue, call Rutherford support to re-activate the alt pack, and then write off the inventory to zero out the three pallets and erase the alt-pack. Then either create a re-pack or a negative write off to add the three pallets to a newly created correct alt-pack. It is impossible to change the specifics such as the size or conversion information of an alt-pack after it is setup. If it is set up incorrectly, the inventory on that pack needs to be depleted, add the new alt-pack, create a new inventory batch and reconcile that primary pack and all alt-packs making sure to zero the qty for the bad entry. Once that’s done the bad alt-pack can be erased. Additionally, Alt-Packs can be incorrectly set up within the system. Check with Rutherford support if errors are occurring. Suppliers are anyone who provides products and items to the company. While Suppliers need to be associated with a product in order to populate the Inventory section of a New purchase, any products may be purchased from suppliers. It is suggested, however, that for reporting purposes suppliers are added to a Product record. The purchase entry notes will be added to each created purchase in the system for the selected supplier. These notes will be displayed during the purchase entry and delivery. In January 2010, the License # field was added to the Supplier Record. In April 2010, the Rebates panel was added to the Supplier Record. Billing Codes are charges that are not actually products; therefore, they do not affect inventory. Billing codes may include services such as installation or rentals, or can be items like keg taps. Billing codes may show in purchases and orders. To view a tutorial video, see Product Billing Codes Tutorial Video. Add information- Name, Description, Pack Name, Front Line Price, Manual Cost, Tax Class, GL Group, and default credit and debit accounts. Go to the Order Entry Screen. Add a billing code just like an item. Using the drop down arrow, select the item. In the item selector box, check the check box Show Only Parts and Billing Codes. Select the billing code off the list. The Alt-Packs panel can be used to create billing code alt-packs which are similar to Product Alt-Packs. An alt-pack for a billing code is typically for fractional service hours. To create an alt-pack, click the command button Add New Pack. Type in the pack name and the front line price. The primary pack contains option - This radio button indicates that this alternate pack is smaller than the primary pack. The number selected, in the spinner to the right, specifies how many of these Alt-Packs are in the primary pack. This alternate pack contains option - This radio button indicates that this alternate pack is larger than the primary pack. The number selected, in the spinner to the right, specifies how many of these Alt-Packs are in the primary pack. In this panel, any notes about the selected billing code may be placed. This segment shows any reports related to the billing code. The selected report can be changed under the Report segment at the bottom and by the time period. The reports shown here can be sent to both the printer and excel. For more information, see Reports Panel. Specify record number by either select the provided number or create your own. Add information- Name, License #, Tax ID, Hours, Ship From address, Mail to address, and purchase entry notes. After the creation of a supplier record, go to Record>Product>Records Suppliers panel. Use the drop down arrow to select the supplier. Select the pack size. Note: Each pack size may have a different supplier. When finished making changes, click the command button Add Supplier for Pack. After the creation of a supplier record, go to Record>Product>Parts Suppliers panel. This segment allows the control of the contact information. Additionally, to re-arrange the order of the contacts, select Move selected contact up or move selected contact down. This section allows for any additional notes. This function uses Microsoft MapPoint® to pinpoint the exact location. The sales panel is a chart listing the summary of retail sales for the supplier. For more information see Sales Analyzer. This panel is used to record the payment terms and general ledger information for the selected supplier. Typically these terms are only used for reports; however, with an export to an attached Accounting system, this information can supply an approximate "Due date" for payments. The General Ledger and accounts payable section of the panel is used to add a vendor ID, a GL Supplier Group, and trading partner information for the selected supplier. This section lists the current inventory the company has obtained from the selected supplier. This panel also lists the location of the products and the attached Audit trail for that item. Added in April 2010, this panel assists with the scenario where, although there isn't a promotion setup in the system, a supplier may reimburse a distributor if an item's net sell price is within a maximum allowance range. Supplier rebates are often given based on the net selling price of an item in relation to the supplier's suggested price-to-retail. In most cases, the distributor is reimbursed up to the max allowance based on a percentage of the difference between the supplier's suggested price-to-retail and the net selling price of an item. This panel supports tiers where the max allowance and percentage used to determine the rebate may vary. As such, the Rebates panel is situated in such a manner to facilitate such ideas. To use this panel, use the drop down arrows to select the From and Through dates. Use the drop down arrow to select the item and input the Suggested PTR (Price-To-Retail) amount. Input the Net PTR, Max Allowance, and Split % and click the command button Add. For additional information on rebates, see Supplier Rebates. The Supplier's website may be linked here. This panel is used to add supplier type information which is used for taxing and reporting purposes. For more information, see Supplier Beverage Panel. This segment shows any reports related to the Supplier Records. The selected report can be changed under the Report segment at the bottom and by the time period. The reports shown here can be sent to both the printer and excel. For more information, see Reports Panel. This page was last modified on 17 July 2018, at 14:19.